Whether you’re a native or a transplant, everyone can acknowledge that Chicago is….well, pretty awesome! Chicago is one of the few cities in the world that offers everything under the sun – we have a sports team in every league, over 7,000 restaurants with everything from the world’s best hamburger to whole roasted goats, a place to drink on every corner, 40 museums, and over a dozen universities. Every nationality, age group, income level, and industry is represented in the city and its suburbs. Chicago is not only one of the largest economies in the US, but one of the most competitive. There are 600+ creative marketing and advertising agencies in Chicago, an ever-increasing number of established companies and startups fighting for market share in every area from financial solutions to hardware and hammers. It can be a challenge to stand out as a Chicago business with so much competition. And that’s why we’re here to help – to be your Sherpas through the competitive landscapes of Chicago and Google search, and to give you the insights needed to start ranking and pulling organic traffic from your Chicago neighbors. Considering you’re on an SEO company’s website, we’re going to assume you get the general idea of SEO. If you don’t, our guide to teaching yourself SEO can help give you the baseline knowledge needed before you go any further into this guide. These factors in relation to inbound links to your site hold the most weight when it comes to performing well in organic search. The second factor is the ‘quality’ of your website – are pages segmented properly? Is there a helpful, relevant copy on the page? Does the site look good on a mobile device? Starting a blog for your local business. Google+ My Business: is the business’ Google+ set up properly? Does it have a description, reviews, etc.? Review Signals: are their reviews for the business on Google+, Yelp!, or other external sources? Are there a significant number of reviews? Are they consistently getting reviews? A great place to start as a local business is with the Local SEO Checklist which covers most of the bases when it comes to ensuring your site is set up well to rank in the Chicago market. Much like inbound links, not all citation sources are created equal. The value of individual citation sources depends on a number of factors. Not all citation sources are available in all cities. Not all citation sources are available to all businesses (for example, Avvo.com is commonly listed as an important citation source…if you are a lawyer. To everyone else, it’s worthless). Whitespark.ca puts out an annual list of the top citation sources weighted for each city. If you’re a local business in Chicago, here are the top citation sources you should be paying attention to. How to claim/get this citation: Visit business.angieslist.com and enter business information. Can create a profile for free. How to claim/get this citation: Visit www.indeed.com to claim a company profile with Indeed.com and acquire this citation. How to claim/get this citation: Visit www.bbb.org to get started. Registration is free. How to claim/get this citation: Visit www.facebook.com/business to learn how to set up a Facebook page for your business. How to claim/get this citation: Visit local.chicagotribune.com to view listings and submit your business. Powered by the Axicom network. 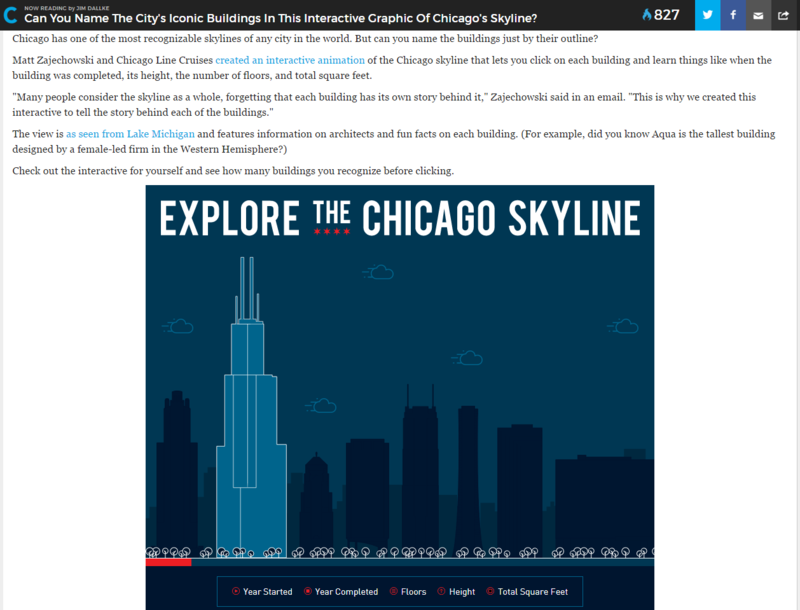 How to claim/get this citation: Visit http://www.chicagomag.com/marketplace/ to post an ad for your business. Businesses featured include products for sale, shopping, home contractors, travel, real estate, and more. How to claim/get this citation: Visit www.timeout.com to submit your business. Open to entertainment establishments such as bars, restaurants, and music venues. However, if you host an event at your business, you may be able to get featured even if you don’t fit the criteria. How to claim/get this citation: Visit en.wikipedia.org for information on how to create a Wikipedia page for your business. How to claim/get this citation: Visit www.homeadvisor.com to begin the process of claiming your business. Download the pdf with all of Chicago’s content publishers (and more!) here. A publication like the Chicago Tribune isn’t going to publish just anyone. Red Eye isn’t going to call out your business because you were nice to them. You need to provide something that’s engaging, relevant to Chicago-area readers, and is unique from what other businesses have the capabilities to offer. You want to create something -somewhat- related to your business – it doesn’t have to be an exact match, but you need to have a certain position of authority. Our team created an interactive map where residents of Illinois, Wisconsin, and Indiana could vote on their team allegiance. We separated the votes based on county to give a visual representation of “Bears Nation”, “Packers Land”, etc. etc. 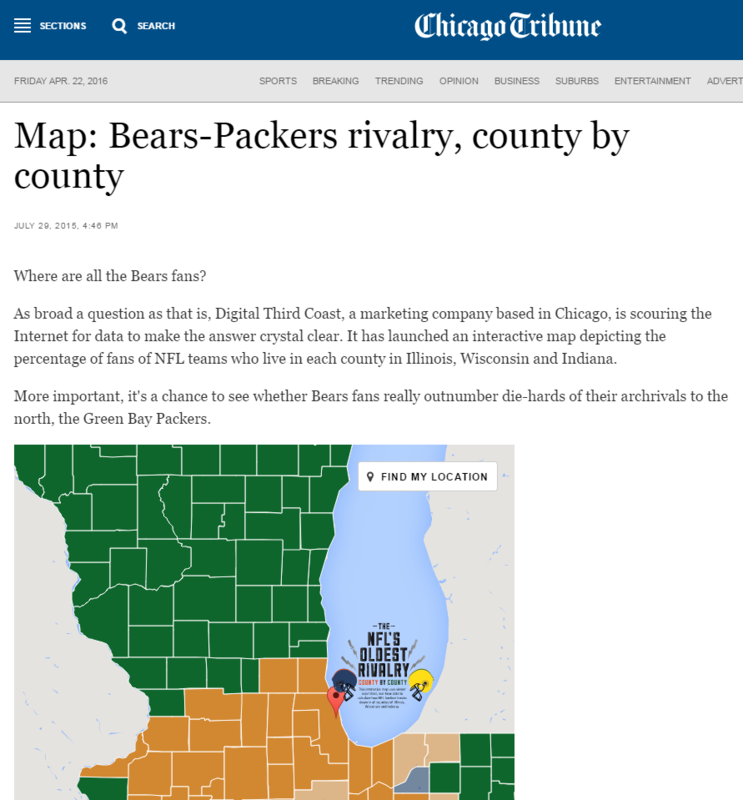 The desire of fans to represent their team resulted in thousands of votes and an very cool interactive map that ran on Chicago Tribune, Red Eye, Windy City Gridiron; as well as several Wisconsin publications and USA Today. Everyone in Chicago takes pride in the gorgeous skyline the city has built. From historical legends such as the Wrigley Building and modern marvels like the Aqua building, the skyline is a huge part of Chicago’s identity and a sight that both natives and tourists love to behold. But how well do you know the Chicago skyline? Do you know the story behind those buildings? Chicago Line Cruises offers architectural tours on the Chicago River, and put this knowledge to use by creating a guide to the skyscrapers of Chicago. Each building is featured with the date it was built, the firm who designed it, it’s proper name, and a bit of backstory on the building itself. Now anyone can be an expert on Chicago architecture. This interactive graphic was featured on DNA Info, Streetwise, Time Out Chicago, and Curbed Chicago – all helping to boost Chicago Line’s local rankings. HARO Requests: HARO (Help a Reporter Out) is an e-mail service which sends alerts from reports looking to interview people for a story. It’s a great option not only for local publications but industry and national exposure as well. Be Awesome: Okay. This one’s a little vague. But unless you have a compelling piece of content, you need something that will make a write want to cover your business. Built In Chicago is a great resource for this – you’ll find plenty of articles about how companies are doing cool things or the best in employee perks. Crain’s, The Tribune – there’s opportunity to be had here, if you can bring something unique to the table. Local Chamber of Commerce websites provide a great opportunity to not only support your local community and fellow local businesses, but to gain a valuable local backlink and improve your local search rankings. It’s definitely worth joining the Chicagoland chamber as they are the largest, however links to websites from their directory are not indexed due to the way the website is set up. Writing a guest post for the chamber’s blog on your area of expertise. Here’s an example of what we’ve done recently – we reached out to the Wicker Park chamber and offered to do a guest post on Local SEO for them. Boom, link. Reach out to the chamber and offer to write an article for them on your area of expertise – it works pretty often! Most of the people running these websites are volunteers and could use fresh content. Below is a table of link opportunities for each neighborhood association. With blog and events, if ‘no’ is indicated, it means that these areas don’t link out at the moment. There still could be some value in reaching out to these chambers and sponsoring an event (and asking them to link back to you), but it doesn’t appear to be their current practice at this time. Universities provide another avenue for local exposure and valuable inbound links. Educational institutions have the benefit of typically having a very high domain authority – meaning links from these websites to your business can be incredibly valuable. Discounts: Most universities and colleges offer discounts to students and staff at local businesses. Contact the university and offer a discount to their school, and they’ll link out to you. Events: Schools are always hosting events, both for fun and educational purposes. Reach out and offer to give a seminar or be a sponsor of an on-campus concert/performance/etc. to get an inbound link. In addition to the opportunities provided by sponsoring an event with your local chamber of commerce, there are several dedicated event websites that post events in the city of Chicago as well as the surrounding metro area. They provide yet another opportunity to gain more visibility and give back to your local community while improving your local search presence. This list exhausts most of the local publications and content placements we’ve secured for ourselves or our client’s over the years. Since we are located in Chicago, we wanted to give back to the local businesses that we know and love who might be trying to do SEO and link building on their own. Some of these are really simple links to earn and if you have any questions, or know of any publications and/or websites that we missed, be sure to let us know. Next Next post: Big Brands With Big Budgets—How Do Small Businesses Compete?